LIP-3WMB genuine Sony 'Gumstick' (Sony LIP3WMB, Sony LIP-3WMB) 340mAh Li-Ion. Audio battery. Type: Lithium-Ion 'Gumstick'. Voltage: 3.7 V. Capacity: 340 mAh. Height: 63.3 mm. Width: 23.1 mm. Depth: 3.5 mm. Price: £19.99. Postage and packing included. Replaces: This is a genuine Sony LIP-3WMB battery. 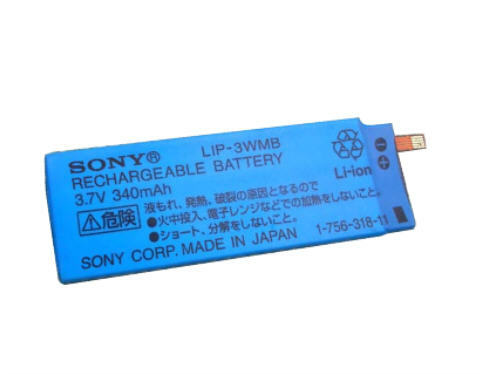 This Sony LIP-3WMB Lithium-Ion 'Gumstick' battery, powers Sony Hi-MD portable walkmans. If your gumstick battery is Sony NH-13WMB, Sony NH-10WM or Sony NC-6WM NiMH (and not Lithium-Ion) look at our 1350mAh rechargeable gum stick battery. If your gum stick battery is Lithium-Ion (but from Sharp, Pioneer or Kenwood) look at this Li-Ion rechargeable gum stick battery.